1. Place the sugar, glucose and 50ml of cold water in a saucepan, and slowly bring up to the boil until the syrup reaches 110°C on a sugar thermometer. 2. At this stage, tip the egg whites into the bowl of a free standing mixer fitted with a whisk attachment, and whisk until firm peaks form. 3. Continue to heat the syrup and as soon as it reaches 118°C (soft ball temperature) remove the pan from the heat. 4. Resume whisking the egg whites at a lower speed and slowly pour in the syrup in a steady stream, until all of it is incorporated. Continue beating for 10 minutes, until the meringue is thick and glossy. 5. Spoon the lemon curd into the cases and top with a layer of raspberries. 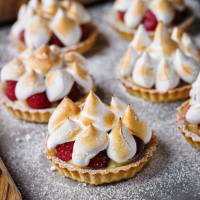 Spoon the meringue into a piping bag, snip off the end and pipe mini peaks on top of the raspberries. Toast with a blowtorch until the meringue is golden. Dust with icing sugar and serve.